Run of the mill IPA. A bit thin on the body. Wouldn't close my mouth it was poured on top of me. Bottle from M&S, thanks to/shared at folks in London - (as M&S Staffordshire IPA) golden amber pour with white head. Sweet and toasty malty, with some vague citrus fruity notes, sweet caramel malty, some cereal, light to medium body, twiggy subdued hoppy finish. UPDATED: NOV 15, 2017 As m & s stafforshore ipa . Gold fine head. Peppery. minerals. Finish is dry as a bone. 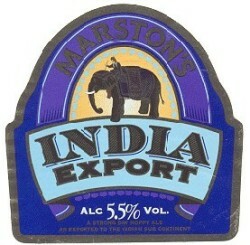 [Mark & Spencer, Staffordshire IPA] Pours crystal clear golden colored body with a white head that settles quickly. Aroma is slightly grassy, citrusy with a hint of pine. Taste is sweet up front with a grassy, almost floral hop note following. More sweet than bitter. Light mouthfeel, crisp carbonation, medium body. Pours golden/amber, fizzy and very carbonated, with a medium white head and some lacing. Aroma is lager malts and hops, to understand that the IPA in its name it’s a fraud! Tastes bitter, lager malts, some lemony notes, thin body, lively carbonation. Feel like a boring lager with 1 hop cone in it. Boring boring boring. From old tasting notes. Amber orange color topped by a fine creamy beige head. Soft fruity malt aroma. Faint malt flavor has a brief bitter backdrop. Very peppery and dry. Bottle for my birthday from in laws. Golden amber beer with large head. Aroma of malts. Taste is dry malt, spice, dried fruit, citrus and hop bitterness. OK.
Marks & Spencer bottling. This is OK! It’s certainly the original style of IPA rather than the very hoppy style of today’s craft brewers. It is hoppy but in a gentle way. It’s alright! Pours amber with medium white head. Aroma is malty, caramel, candies, some light grass, grainy. Taste is dusty, malts, some sweetness, caramel, dry, floral, herbs. Quite dry beer!